Preheat the grill to medium-high heat and gather your ingredients. Add the chicken to a bowl and toss with 2 tablespoons of the BBQ sauce. Wrap each piece of chicken with 1/2 a slice of bacon. 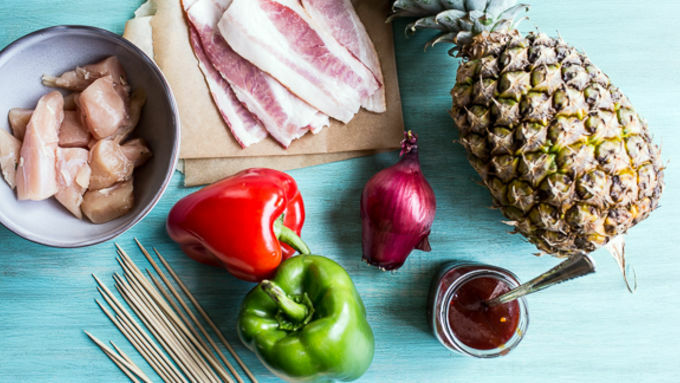 Thread the bacon-wrapped chicken on skewers, alternating with red peppers, green peppers, red onions and pineapple cubes. Once you've made all the skewers, place them on the hot grill. 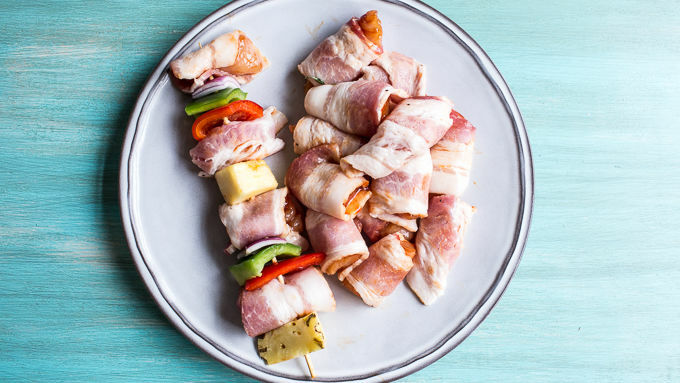 Grill the skewers until bacon has browned and crisped and chicken has cooked through, 3-4 minutes per side. During the last minute of cooking, brush each skewer with BBQ sauce all over. Remove from grill and let rest for 5 minutes, then serve immediately with additional BBQ sauce on the side for dipping. Enjoy! Discard any unused BBQ sauce that was used to brush the raw meat. Use fresh BBQ for dipping cooked kabobs if desired. Feel free to use your favorite veggie combos. You could try zucchini and corn, tomatoes and peppers, or any of your faves. 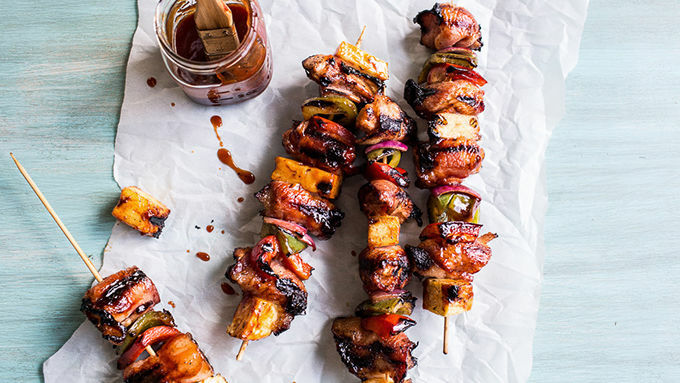 For an Asian twist on these, replace the BBQ sauce with Teriyaki sauce. 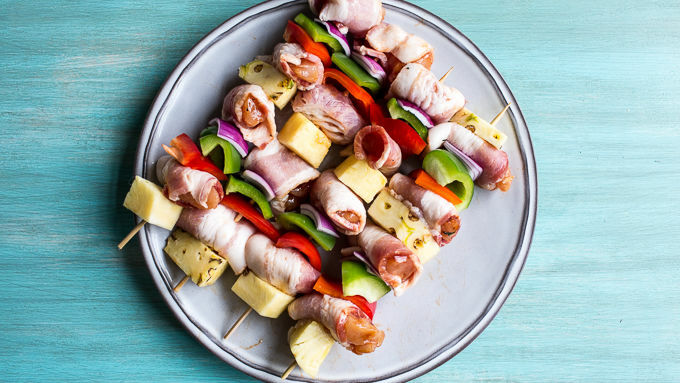 Easy chicken and vegetable kabobs are made much tastier with bacon! Simple goodness on the grill. It’s what summer’s made for. We all know that sometimes the simplest dinners are the best, right? Clearly, that’s the case with these chicken kabobs. They’re so simple, but so delicious. With just 7 ingredients and minimal prep time, you can have these kabobs on the dinner table in less than 40 minutes. And of course, the best part is simply how delicious these kabobs are. I mean, bacon-wrapped chicken. Grilled veggies. Grilled pineapple. Am I right?! Yeah, that’s what I like to call a winning combo. Plus, with the weather heating up and temps in our homes rising, the grill is often our best option. Grilling has other benefits, too. Excess fats drip off, vegetables retain more vitamins and minerals, meats retain more of the key vitamins of riboflavin and thiamine, and moisture is sealed in better, keeping food tender. Discard any unused BBQ sauce that was used to brush the raw meat. Use fresh BBQ for dipping cooked kabobs if desired. Feel free to use your favorite veggie combos. You could try zucchini and corn, tomatoes and peppers, or any of your faves. For an Asian twist on these, replace the BBQ sauce with Teriyaki sauce. Now we’re talkin’ summer!